We're all for globalisation on many levels. The one frustrating thing about it, though, is that so many products and ideas remain hidden despite the vast transfer of knowledge on the internet. 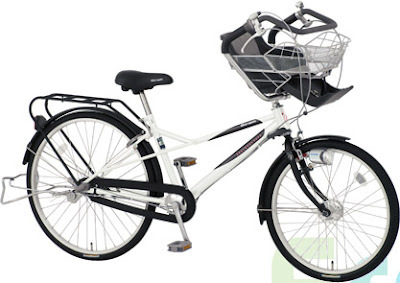 In a post over at Copenhagen Cycle Chic about Danish bike brands, you quickly realise that there are dozens of bike makes that are only available in Denmark or Northern Europe and that will never make it to other parts of the world. 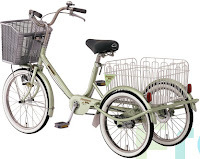 A Swedish reader put us onto this Japanese bike brand Frackers from Maruishi Cycles and we're shaking our heads and wondering why the hell these aren't available on every street corner in Copenhagen. The website is in Japanese. 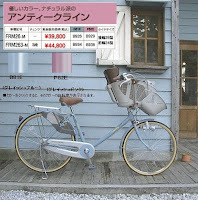 Japan is one of industrialised world's great bike cultures. We've blogged about how Japanese mothers are a political powerhouse and we're now traced our way to one of the brands that carry them effortlessly about, with their children. It's illegal to drop your kids off at daycare or school in cars in Japan, so having the right kind of bike and kids' seats is paramount. 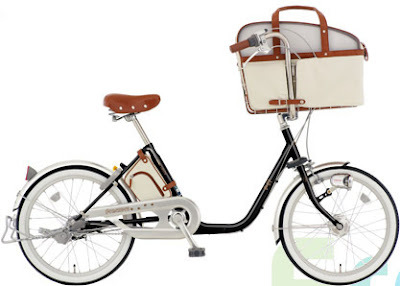 It's about the bikes, sure, which are cool and stylish and practical. But the Japanese are good at accessories, too. A lot of effort goes into getting the kids to sit comfortably. Splendid bike seats, fully adjustable in ways we may never understand, are standard issue. The bike above is the Frackers Pa-pa - for discerning dads. Here's the Frackers Ma-ma, ready to roll with a great seat for the kid up front. Note that chainguards, fenders and kickstands are standard gear, like in Europe. The kickstand, though, is a heavy duty, stabile stand on the back wheel for steadiness when putting the kids, groceries or both on board. It's not just kids who need to get around. Frackers does a whole line of pet transport options for carrying the mutt or the feline around. Then there is their Shopping trke. Three wheeled ease-of-use which leans into the curves. On every trip I make to Japan I end up at the departure gate at Narita planning the next trip. Now I know that I have to figure out how to get one of these bikes home with me. When travelling from Europe Japan is cheap because of the strength of the Euro and it's amazing to discover that these bikes cost the same as an average bike in a Copenhagen bike shop. Not a flash bike, just a basic granny bike. About 3300 kroner. Divide by five for those dollar thingys. 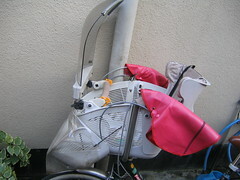 At the very least, despite my frustration, I now know the origins of this strange contraption I photographed in Tokyo. And here's a great article about the Frackers and about cycling in Japan.